Olivia’s dad, a marine biologist has instilled in her the importance of a clean ocean since she was a little girl. They combed the beaches searching for what he called a magic conch shell for many years but never found it. While working on a project in the Caribbean years later he goes missing at sea. 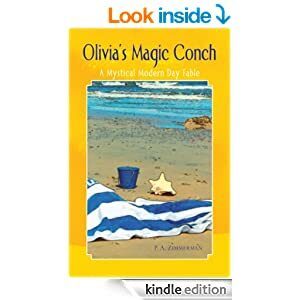 An especially tragic mishap on her birthday; the day he promised they would find the elusive shell; leaves Olivia sad but hopeful he would be found. One year to the day sitting on the beach at the waters edge,reminiscing about the times spent with her dad,she wriggles her toes deeper and deeper into the cool wet sand piling up with each new wave. When her big toe bumps into something hard she begins to dig with her hands. Digging and digging she doesn’t stop until she can grasp the object and pull it loose. When she has it in both hands her heart races …..could it be the magic conch? On her birthday? This book is a modern day fable braided with factual information to bring awareness to the youth of today about the importance of keeping our oceans clean. Saving the fish and wildlife is equally as invaluable to us as humans for what we derive from it. Adventure, fantasy, animation, and a learning factor all interlaced for ages 9 and up. You can get it in print or as an EBook.